A gorgeous Mid-Century Modern find! 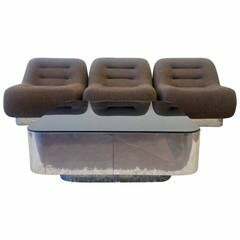 This early Erasmo sofa designed by Afra and Tobia Scarpa is a real stunner. The striped mid mod fabric and moveable pieces make for a great modular sectional. Designed in Italy with B&B Italia, distributed by B&B America. Wear consistent with age and use. The fabric is in good shape, there are a couple pulls on the fabric, but not noticeable under casual observation. Set of two Afra and Tobia Scarpa "Dialogo" chair for B&B Italia, 1970s Black fibreglass seat and back and oak angular frame. Embossed B&B Italia mark. Pair of lounge and comfy leather Coronado armchairs design by Afra & Tobia Scarpa for B&B Italia.